Yesterday I had a great evening of music in London. Started off with a trip around the Rough Trade East shop where my musicadar picked up on a Shuggie Otis album -intrigued, I checked out some of his songs today and well, I don't really know why I've never heard of him before. So Shuggie, (son of the rhythm and blues bandleader Johnny Otis), was a guitar prodigy, but he didn’t stop there. An exceptional drummer and vibraphone player, he immersed himself in drum-machine technology in its earliest incarnation. He played piano and organ, and he arranged for horns and strings; his friends say he was at least as good a bass player as he was a guitarist. Shuggie released his first solo album in 1970 and cut sessions with Frank Zappa and Al Kooper, then set out on his own. "Freedom Flight" combined his innate fluency in the blues with a budding interest in exploratory, style-fusing soundscapes. He became a musicians musician and his album Inspiration Information (which reached number 56 in the R&B chart) seemed too futuristic for the crowd of 1974 and Shuggie didn't reach the dizzy heights he probably should have done. Shuggie makes the occasional recording session, the odd live gig. But health issues have kept him from sustaining his musical career with any consistency. As his website says "Shuggie Otis should have been a West Coast superstar, a genius, a musical wizard of the highest order." Shuggie's music is a mix of ballads, boogies, soul, and out and out funk and I really like it. Here's Ah Uh Mi Hed or Out of my head of the album Insipration Information-This song needs to be heard! Ah Uh Mi Hed has recently been included on the soundtrack for channel 4's emo/strange drama Skins. 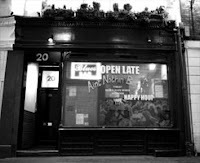 After my trip to Rough Trade I checked out Londons Ain't Nothin But Blues bar on Kingly street where the normal Monday night Blues jam proceedings were underway on the tiniest stage you can possibly imagine. Great night, free music but absolutely jam packed. I hadn't realised how overdue I was on a Blues top up. Going back for more at the end of the month.